I almost titled this post, you can’t get there from here. It seems there is no direct way for us to get over to Costco from where we live. So, I noticed I am not using them for many of my purchases, just because of the time it takes to navigate through Columbia. No direct way from west county. I end up using Rte. 108 all the way around to go in the back way through Lark Brown to avoid the delays on the other roads. That means I really stock up when I go there. Very little food these days though. It seems to be my Go To place for toiletries, paper goods, spices, oils, chicken broth, printer cartridges, and my personal favorite ridiculously expensive item, Sonicare toothbrush heads. Why in the world do they cost so much? I made sure I got enough olive oil, nuts, garlic powder and chicken stock, the low sodium one that I like to use for making couscous and risotto. Hopefully it will be another 3-4 months until I need to go back. 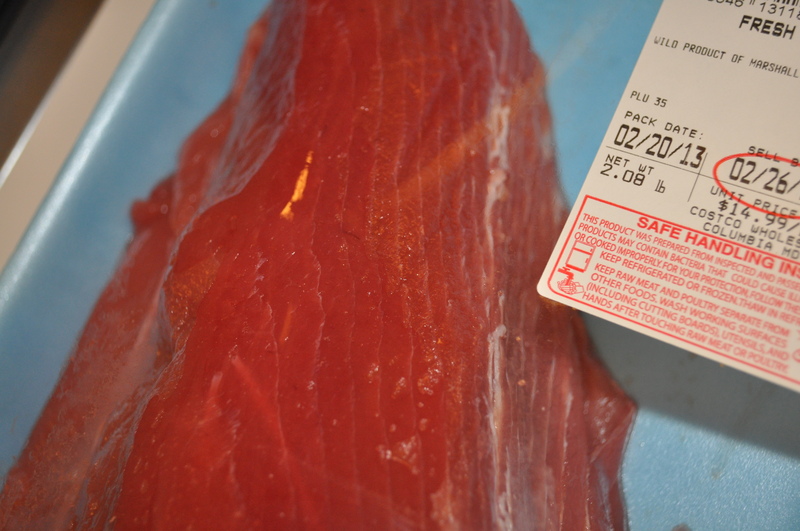 The only real food items I bought, and this is indicative of how we have changed our eating habits, were lemons, limes, Meyer lemons, oranges, and “WOOHOO” I found one of those lovely large ends of wild ahi. 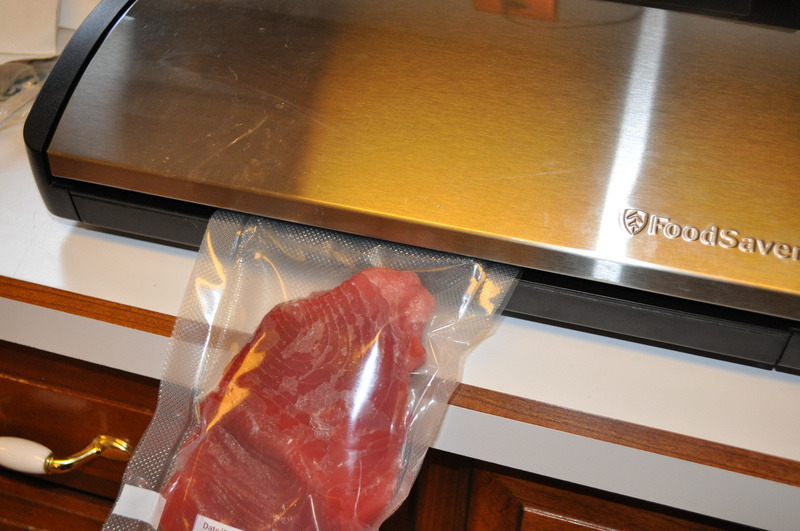 My one huge splurge for raw fish, and I love getting the end piece to portion out and make 4-5 meals from it. Two pounds. I ended up making three vacuum seal bags out of it. 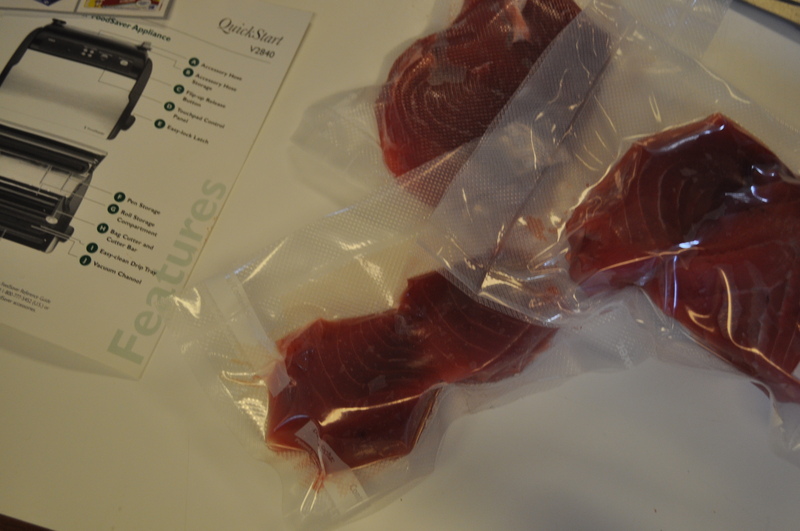 Two have those perfect thick filets and one has about a pound of the under side and the very bottom. The large one will make one of my slow cooked oven braised in tomatoes and olive oil, Tuscan style tuna — which will serve us for two meals. The smaller ones will be pan seared, maybe coated with sesame seeds and a little garlic. 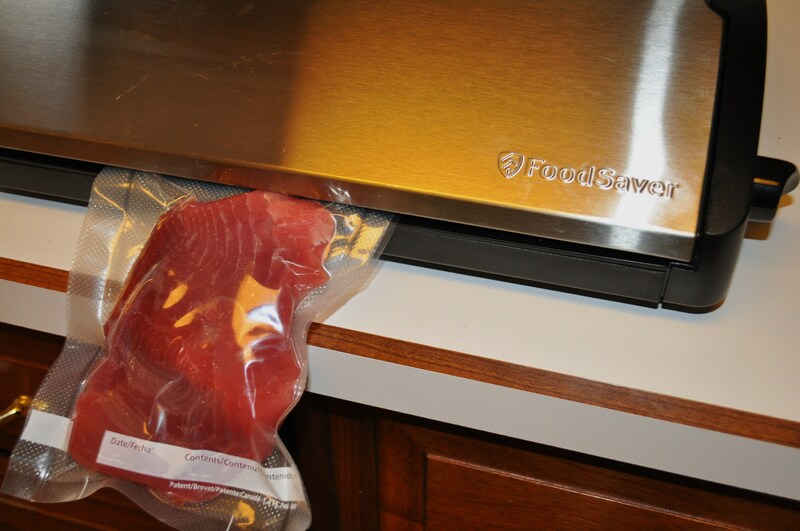 Now that I have the vacuum sealer from my brother, I know the freezer won’t dry out or burn this fish. It was really easy to make the bags. I am really liking this machine. I have learned a little trick with the 11″ roll. Cut a short piece of it. Turn it sideways and seal the open two sides, making a fully sealed plastic pouch. 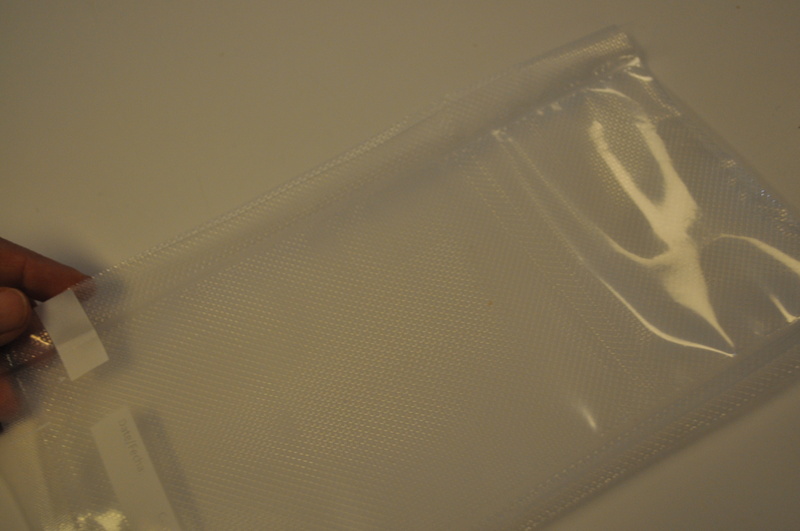 Now, cut off one of the “permanent” sealed edges, to get a long thin bag. This puts the white strip for writing on the bottom instead of the side, and you use less plastic for smaller items. You need that three inch section to go into the machine. Why waste 3 inches by 11 inches to put it in horizontally, when you only vacuum and seal on the three inches by five or six inches. You get much more mileage out of the roll, doing it this way. The thin seals made by the machine are now on the sides, and the thick original seal is on the bottom. I ended up with three nicely portioned bags, one to be taken out and used this weekend, the others to stay fresh in the freezer for weeks. Since this worked so well, I may be getting some large packs in the future of scallops, and make them into single serve portions. I also can’t wait for summer, when I can freeze fruit from Larriland. Posted in Food, Real Food and tagged cooking, Food, foodie, foodsaver, real food. Bookmark the permalink. Retired, I am following my dream of living in quiet west Howard County, a rural oasis, not far from the urban chaos, but just far enough. I love to cook, bake, garden, and travel. I volunteer at Howard County Conservancy. I lead nature hikes, manage programs and show children all the wonders of nature, and the agricultural connection to their food.